Sixth time’s a charm! 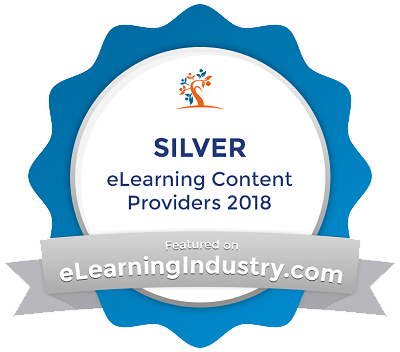 We are ecstatic to announce our list of top eLearning content development companies for the 6th time in a row – and this year, we’ve decided to step up the list game. Here are our picks for 2018… plus a couple of aces up our sleeve! Every year, eLearning Industry evaluates hundreds of eLearning content development companies to determine which ones stand out for their long-standing, enterprise-wide commitment to eLearning content development excellence. Over the course of several months, we scoured the eLearning landscape for inventive companies that deliver true value to their customers, constantly improving their experience. 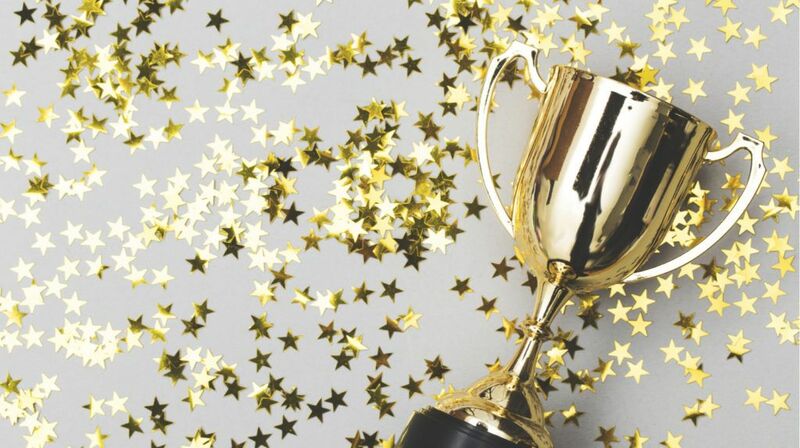 As you may guess, sustaining a consistently high level of performance requires unique capabilities; this is why this year we’ve decided to create a triad of special awards for those leading firms whose presence has a truly impressive impact on the eLearning landscape: The 2018 Platinum, Gold, and Silver eLearning Industry awards. 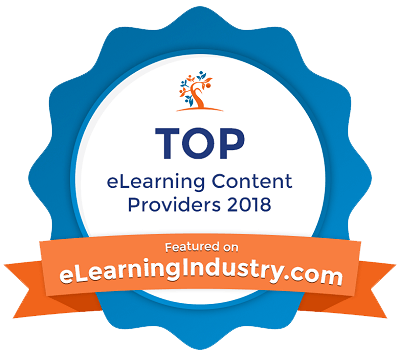 Of course, our list of Top 10 eLearning Development Companies For 2018 is here as well. It is clear that these 10 companies are motivated not only by financial success but by something deeper: customer trust and loyalty. These 10 businesses have a strong, purpose-driven company culture, truly take care of their customers, and provide superb eLearning products and services. Finally, just like we did last year, we’ll showcase a list of 10 High Value eLearning Content Development Companies: these corporations provide high-quality, innovating, and immersive eLearning solutions, and recognizing their outstanding potential in the highly competitive eLearning market is simply a must. So, without further ado, *big drum sound*, allow us to present you our Top eLearning Content Development For 2018! SweetRush has captured a singular space in the industry. Clients trust SweetRush and love its culture of caring & commitment, and its uniquely effective solutions that connect with and motivate learners. From analysis and solution design to all facets of blended learning (ILT/VILT, games, mobile, and now VR), SweetRush delivers the industry’s best in performance improvement, along with change management, cultural transformation, and staff augmentation services. Reach out to them here to learn more. For global corporations looking for advanced learning digitization, EI Design's innovative learning designs provide high learnability, thus creating a positive ROI. EI Design's learning and performance solutions create the right learner engagement (by keeping learning engaging, relevant, and impactful) and spark behavioral change. Their portfolio has a blend of new approaches like Virtual Reality, along with gamification, microlearning, and social learning to offer mobile learning or blended training. Check EI Design's customer reviews! Kineo enables the world's leading businesses to improve performance through learning and technology. Founded in 2005, Kineo has a reputation for creative, innovative and flexible content design and development and technology tools, as well as for award-winning work that gets results around the globe. Contact them to discover how Kineo can help your organization. Check Kineo's customer reviews here! 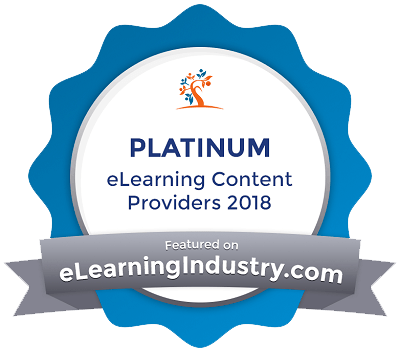 If you are among the 10 Top eLearning Content Development Companies For 2018, feel free to add this badge to your website! Learning Pool has a fresh approach to partnering with their customers. One that makes a real difference with a 98% customer satisfaction rate. Recent Gold winners for outstanding content development with their customer, Schlumberger, at Learning Technologies awards, Learning Pool’s award-winning team works closely with each of their customers to deliver high-quality service that produces real benefits and tangible returns. Their extensive bespoke content development services can deliver fully editable content, allowing customers to update and maintain their eLearning at no cost for as long as they want, working with customers such as New Look, Specsavers, and EDF Energy. Learning Pool has recently been awarded the Gold Investors in People, been listed in the Sunday Times Best Companies to work for, and received the Customer Focus Award at the Institute of Customer Service. Check Learning Pool's customer reviews here! InfoPro Learning, a leading provider in corporate training and human capital transformation, helps organizations create an exceptional employee and customer experience through custom eLearning solutions. For more than 25 years, InfoPro Learning has designed and implemented engaging learning experiences that attract, develop, and retain talent across the entire employee lifecycle. Check here some impressive case studies, and to learn more and request a demo click here. Check InfoPro Learning's customer reviews here! CommLab India is the Fortune 500’s most sought-after partner for rapid eLearning solutions. Combining its formidable authoring tools expertise with its 18 years’ experience in corporate training and Instructional Design, the company enhances the employee performance of their clients’ by converting ILT material into eLearning curriculums and blending classroom, eLearning, and microlearning. CommLab upgrades legacy courses to contemporary HTML5 format for multi-device delivery at unprecedented scale and speed. The company also translates eLearning courses into more than 35 international languages. Check CommLab India's customer reviews here! As a global corporate training provider, AllenComm has a proven record of helping clients improve employee performance through custom training and digital learning solutions. AllenComm takes the time to get to know their clients, their learners, and their organization. Check AllenComm's customer reviews here! Kallidus works with some of Britain's biggest brands to produce award-winning eLearning content. Their team has been designing great bespoke eLearning for 18 years for people such as McDonald's, AstraZeneca, and Barclays. Whether it's anything from personalized microlearning to scenario-based training, they have the experience to create something outstanding for you. Here you can check their previous work. Check Kallidus' customer reviews here! Obsidian Learning’s team of Instructional Designers, learning strategists, graphic designers, and software developers have a true passion for creating highly engaging and lasting learning experiences. If you’re interested in interactive learning programs that engage learners, accelerate skills development, and boost overall business performance, then this is the right company for you. Their team of experts can help with authoring tools, custom eLearning development, Learning Management Systems, blended learning, and instructor-led programs. Check Obsidian Learning's customer reviews here! Designing Digitally is an industry leader in the fields of gamification of eLearning, training simulations, serious games, and mobile learning. For over a decade, they have developed custom learning experiences and ecosystems for some of the largest brands in the world. They focus on creating high-quality interactive learning solutions that educate, engage, and entertain employees, resulting in an informed workforce and improved business performance. They also have dog-friendly offices! Knowledge Anywhere is an eLearning company focused on providing flexible and modern Learning and Development solutions that enable organizations to harness the power of an engaged, knowledgeable workforce. Their Learning Management System, as well as their Virtual Reality Training and Course Development services combined with their experience and exceptional customer support, enable their users to create a Learning and Development program that boosts sales and drives company growth. Check Knowledge Anywhere's customer reviews here! Upside Learning is known for creating "Engaging Learning Experiences". Team Upside Learning delivers value to its clients based on 3 principles – Quality, Innovation, and Relationships. The industry has recognized Upside Learning with more than 44 awards, including Brandon Hall and Training Industry. Upside Learning frequently shares with the industry various trends, innovations, solutions, news, findings, and opinions regarding learning design, development, and technology. We invite you to review and benefit from these free resources which include blogs, whitepapers, eBooks, case studies, presentations, webinars, newsletters, and showcase presentations. Check Upside Learning's customer reviews here! Raytheon Professional Services (RPS) brings a consultative approach with clients across industries and global markets delivering training that improves workforce performance and delivers results. Our award-winning solutions include: content design and development, learning technology integration, LMS services, adaptive learning, and strategic alignment. Leveraging decades of expertise and latest technologies, RPS delivers tailored learning solutions in more than 146 countries and 34 languages. Check Raytheon's customer reviews here! 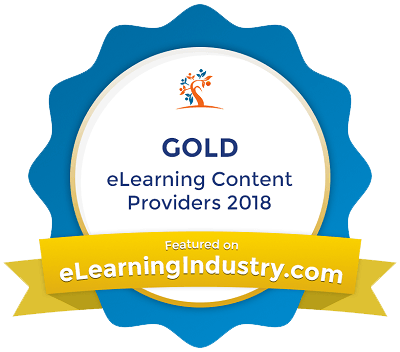 If you are among the 10 High Value eLearning Content Development Companies For 2018, feel free to add this badge to your website! Founded in 1966, GP Strategies (NYSE: GPX) is one of the few truly global performance improvement companies out there. Serving more than 16 diverse industries, GP Strategies is a leader in sales and technical training, eLearning solutions, management consulting, and engineering services. Their commitment to crafting intelligent solutions and delivering extraordinary service helps them attract the brightest minds – professionals who are aligned with their core vision and values. Their innovative services, solutions, and technologies empower companies to perform above their potential. With over 3400 employees worldwide, their industry experts work with 30% of the Fortune 500 companies and some of the largest global organizations each day. Their clients know that they’ll be with them for the long haul to help them perform at their best. Check GP Strategies' customer reviews here! Aims Digital has established itself as a global, learner-centric learning solutions company. Their focus on achieving learning outcomes drives their learning design. Their range of solutions covers every aspect of learning – ILT/VILT, mobile learning, game-based learning, etc. Their clientele includes Fortune 100 companies, and have successfully delivered an impressive array of work. Check Aims Digital's customer reviews here! At Virtual College, they want to help people to use digital technology to learn and grow, equipping them to do great things in their careers. They deliver over 400 online courses, create high-impact bespoke eLearning, and offer a learning management solution with a base of 3 million online learners. They work with all kind of clients, each with their different needs, challenges, and objectives. Check Virtual College's customer reviews here! Check iHasco's customer reviews here! Check Monarch Media's customer reviews here! SureSkills deliver learning and enablement services to the world’s leading technology companies and global organizations. They help you design and develop a 21st-century learning experience that aligns individual and organizational success. They provide tailored digital learning solutions, a range of support services, and fully managed enablement programs. Check SureSkill's customer reviews here! With unlimited support, robust reporting, custom branding, as well as integration and implementation services included, the Roundtable LMS is designed to scale. Its configurable interface allows features and functionality to be switched on or off as your organization grows and changes. Roundtable also creates custom learning experiences including eLearning, AR/VR, ILT, and video learning. They help clients build learning strategies, measure ROI, and bring training to life. Check Roundtable's customer reviews here! Inno-Versity removes complexity from your critical eLearning development projects. Their clients have large eLearning projects with limited time and tight budgets. Their experienced team of Instructional Design and creative professionals will guide you through their proprietary process and bring clarity to your eLearning needs. A US-based, in-house learning agency, their team of 40+ learning professionals are committed to your success. Schedule a free needs assessment here. Check Inno-Versity's customer reviews here! CrossKnowledge is your trusted learning partner, committed to help your workforce acquire the skills they need to succeed by connecting with the entire workplace ecosystem (L&D, managers, and learners), delivering the most advanced integrated learning experiences (built on human and Artificial Intelligence) and measuring learning outcomes (Usage, Satisfaction, Impact). Only CrossKnowledge serves you with unmatched accountability, thanks to its Client Success Team. Check CrossKnowledge's customer reviews here! As a team of dedicated learning designers, The ID Crowd joins forces with others to leverage their combined skills, forming the perfect dream team for your learning project. They bring decades of learning design experience to solve your real-world business problems through education. To them, it’s simple: if you want something new, you have to stop doing something old. They take the adult learning principles of the past and shine a new light on them, forging a path towards the future of learning – towards simplicity, towards sustainability, towards autonomy. Check The ID Crowd's customer reviews here!